3 Creative Examples of April Fools' Day Fun at Shopping-Bargains! Today is April Fools’ Day. For our international readers, April Fools’ Day is celebrated every year on 1 April by playing practical jokes and spreading hoaxes. The jokes and their victims are called April fools. Google has become well-known for their annual “new” features or product announcements on April 1; however, this year’s Gmail Mic Drop apparently didn’t go as planned and was pulled a few hours ago (more details here). Others, though, were very creative and were quite funny. 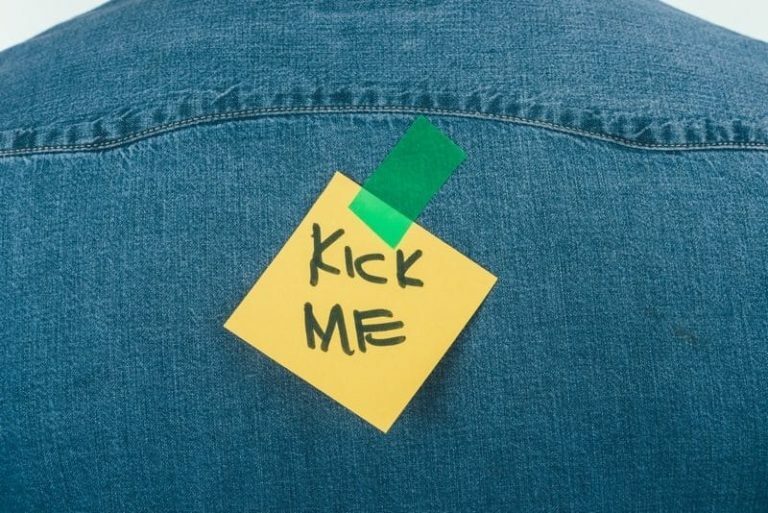 It’s been very interesting to see marketers get involved in sharing April Fools hoaxes and bogus products. Here are three funnies that we ran across today. Enjoy! 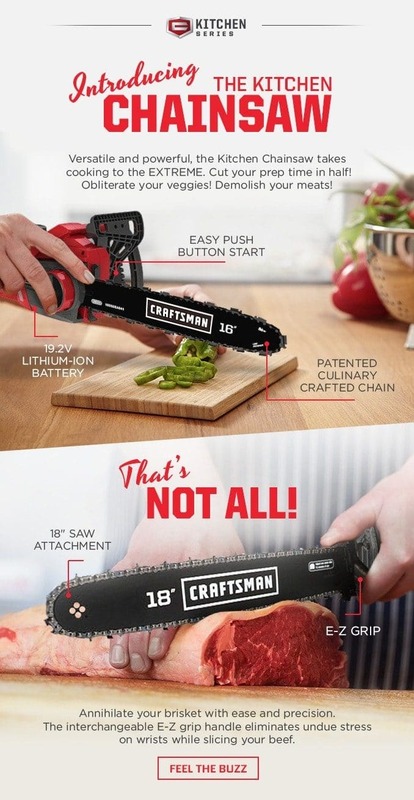 Sears sent out a marketing newsletter introducing their “versatile and powerful” battery-powered Kitchen Chainsaw. 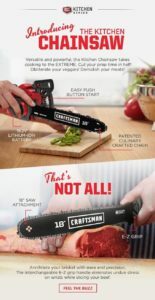 Designed to “cut your prep time in half,” this innovative tool was also described in more detail when announced on their Craftsman Club blog. In case you missed the joke, the fine print in the footer noted that they are “just pulling your chain.” Well done, Sears! Eat Refined Sugar for Weight Loss! Lucky Vitamin is known for their health foods and healthy lifestyle products. When they released an April Fools newsletter filled with astonishing “news stories” it makes you want to click for more. For example, we were teased about a woman losing 200 pounds eating only refined sugar plus other articles suggesting tips for increasing anxiety, eating more genetically altered foods, reducing muscle mass, and other crazy thoughts! A click on these “articles” sent the user to their crazy April Fools “that was a joke, but these savings are serious…” page with a $5 off coupon code! Oh, and they referenced their real LuckyBlog articles too. Great work, Lucky Vitamin! 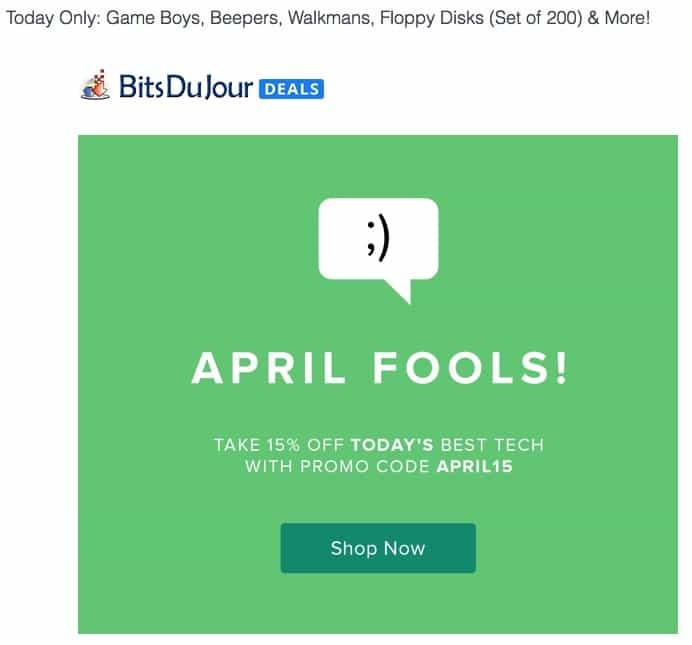 BitsDuJour, known for their deeply discounted software and technology deals, sent out a “today only” email with a subject line announcing specials on “Game Boys, Beepers, Walkmans, Floppy Disks (Set of 200) & More!” Remember those things from the 1990s? Opening up the email revealed an April Fools graphic with a 15% off promo code — APRIL15 of course — to spend on their real deals for today. Good job, BitsDuJour! And there are more… but these three greeted our morning and we wanted to share them with you. Enjoy (click images above to enlarge). And please share your comments and April Fools funnies in the comments section below. Oh my goodness! Awesome article! Many thanks.